Kendama is a traditional Japanese toy. The Kendama is made up of the “Ken” (handle), three cups and the “Tama” (ball), which is connected by a string. Made of wood, the ends of the base and the crosspiece of the hammer are cupped so that they can catch the ball, and the ball has a hole in it that can fit on a spike on the end of the hammer. 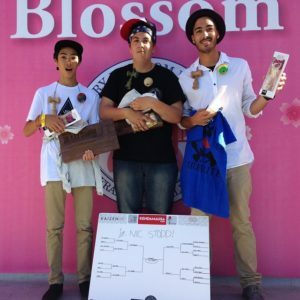 The Sakura Classic is the official Kendama contest of the Northern California Cherry Blossom Festival. Bring your kendama and family to this awesome event on the first weekend. Read more about this year’s open-division style contest on the Sakura Classic 2019 Facebook page! The contest is brought to you by Jake Wiens, The Consulate General of Japan SF, Grain Theory, and the KG Squad.